Choosing a coffee urn for your restaurant or office can be difficult, with so many different designs all focused on doing one main function: to make coffee. However, while some brands solely focus on designs that are cheapest to produce (using easy to dent polished aluminum), Cafe Amoroso focuses on designs that will last, utilizing high grade stainless steel along with critical safety features to keep your staff and your guests safe. 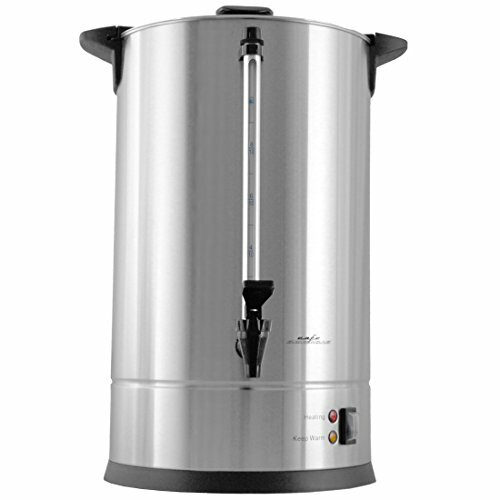 With a classic look featuring a double wall tank design, not only will this 100 cup coffee urn draw less power to maintain temperature, but accidental touches of tank will no longer result in potential burns. Also, with a dripless faucet design, insulated lid and handles, ETL and CSA electrical certifications, we are more than confident that you will be receiving the absolute best value in a quality, and safe, commercial coffee urn. Over all dimensions: H 19" x W 14" x D 12"
DURABLE: Double wall commercial stainless steel body resists dents and maintains lustre over time when compared to polished aluminum models. NO FILTERS: Built-in filter basket eliminates need for disposable filters. SAFE: With a double wall design the sides of the urn remain cooler than in a single wall design. Accidental touches are less likely to result in burns. EFFICIENT: Insulating air fillled space between the inner and outer walls of the urn results in less heat loss and less power drawn by heater. BONUS: Includes a handy drip tray to keep area clean and dry. If you have any questions about this product by Cafe Amoroso, contact us by completing and submitting the form below. If you are looking for a specif part number, please include it with your message.